For over 135 years, Johnson & Johnson has been working worldwide to bring transformational medical innovation. In Australia, we are collaborating with partners around the world to help find solutions for patients. Australia is home to some amazing innovators, problem solvers and entrepreneurs. At the Janssen Pharmaceutical Companies of Johnson & Johnson we believe everyone has the potential to create a better future for healthcare in Australia. One bold idea is all it takes to make a difference. That’s why we at Janssen-Cilag Pty Ltd (Janssen) launched the Janssen Health and Technology Challenge – HaTCH – an initiative designed to help entrepreneurs, start-ups and community organisations realise their ideas for a healthier Australia. In 2014 and again in 2016 we called on Australia’s brightest minds to join us in to help find unique solutions to some of the toughest challenges facing Australian healthcare today. Through a fast-paced innovation competition we challenged startups, entrepreneurs, HealthTech experts and students to use their skills, creativity and awesomeness to solve some of the toughest challenges facing health care in Australia today. The inaugural HaTCH was held in October of 2014. A team of Melbourne health tech innovators won, receiving a grant to accelerate the development of their ‘Footprints’ idea. The sensor system, designed by Quanitcare Technologies, has the ability to predict falls in the elderly before they occur. It constantly monitors walking patterns and informs doctors when intervention is needed. 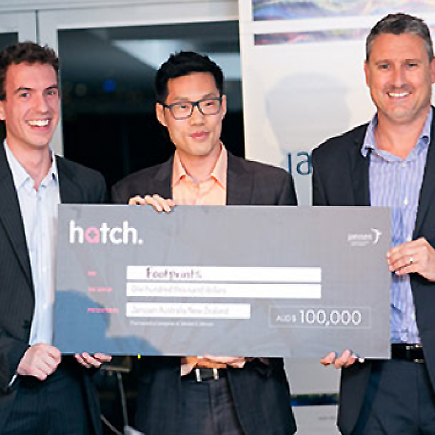 A second event HaTCHathon™ was held in September 2016 where designers, developers, entrepreneurs, one and all, collaborated with startup mentors and subject matter experts before creating and pitching their solutions to a panel of healthcare and technology industry experts. The winning team of Adam Pryor, Afonso Firmo and Ewaldo Moritz took out the first prize with a solution designed to provide support for patients recovering from knee replacement surgery. For more information about HaTCH get in touch via the Contact Us page of our website. * Under the terms and conditions, payment of the $100,000 is subject to the winner, Footprints, entering into a collaboration agreement with Janssen.